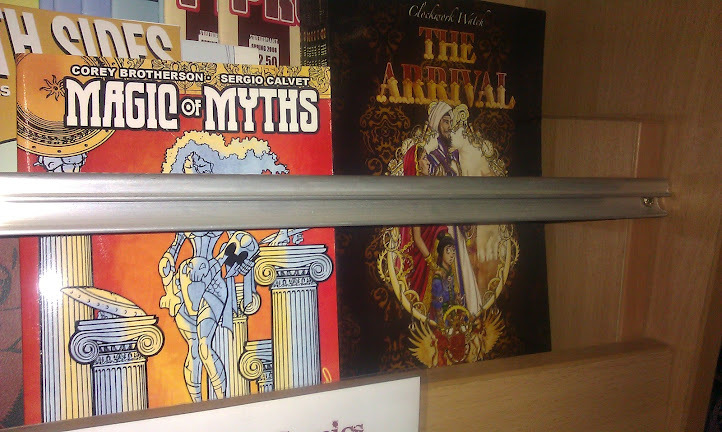 Two books I've worked on - Magic of Myths and Clockwork Watch: The Arrival - for sale. In a shop I've been going to since I was about 8 years-old. I couldn't stop grinning. At 8 years-old I didn't even think about writing my own comics. I was still toying with wanting to be a doctor and, at that time, the idea of being a journalist was starting to creep into my mind. I was reading Transformer comics every week like my life depended on it. And stressing about junior school. By the time I would reach 11 years-old, being a writer would be the only thing I'd ever want to be, but the idea of having my own books or titles that I've worked on, sitting on the shelf of a shop, wasn't even close to being inside my little head. 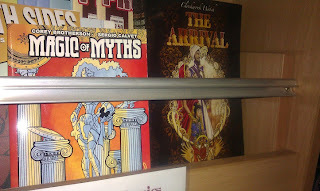 Hopefully by the time you read this, Bayou Arcana will have joined these two books on Nostalgia and Comics' indie shelf. And by the end of the year, a couple more books should be accompanying them. Fingers crossed. My inner 11 year-old is doing cartwheels. My inner 8 year-old probably just thinks this is all a bit strange. And me, right now, at 33 years-old? I'm just bloody grateful.